Introducing my new line of cute knitted headbands for kids! - Visit www.etsy.com/shop/createry or contact me for purchasing. - Headband fits head sizes 16-20 inches in circumference. - Fits approximate age 9 months to 4 years old. 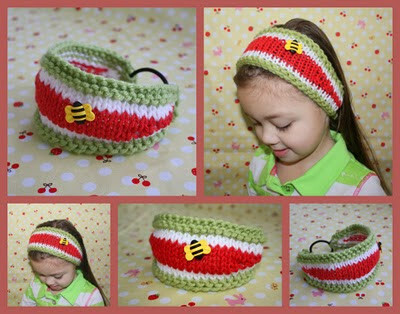 - Headband is hand-knitted with a comfortable fabric hair tie for elasticity. - There are no metal parts in the headband so no snagging on hair! If you would like to purchase this pattern, click on the link below to get it e-mailed to you ASAP! All you need is a paypal account. Enjoy! - Knitting Pattern in PDF Format with color photos. - Pattern has instructions for a 1-color headband and for a 3-color headband. - Finished headband fits head sizes 16-20 inches in circumference. - Fits approximate age 1 to 4 years old. - Pattern incorporates a comfortable fabric hair tie for elasticity. - I suggest you use a hair tie with no metal parts to ensure no snagging on hair! The Createry Shop patterns are protected by copyright. You may not rewrite, redistribute, or resell items or patterns in any form. Patterns are for personal use only and are not for mass production. You may not sell the items made from the patterns without written permission from The Createry Shop.